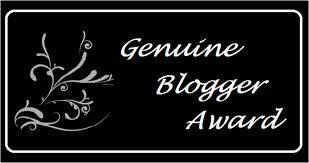 I would like to thank my dear friend Mel of I Am Not She, for tagging me for the Genuine Blogger Award. This is an honor. If nothing else, I have always valued being Genuine and have tried to define that in my life. Thank you so much Mel for thinking of me in this way, and honoring me with your confidence. You are a fellow Genuine Article: True, Wise, Gifted and Generous! The person who Created this Award has asked that no rules be included if we present it to others, we are free to attached the Symbol for this Award or not. So what are Genuine Bloggers? Truly what something is said to be; authentic: “genuine leather”. (of a person, emotion, or action) Sincere. Genuine writing comes from a sincere heart. I believe that Genuine writing takes courage. It is not always easy to be Real. It takes someone with a sincere desire to share their truth. Sharing Genuine feelings and raw experience leads to greater understanding. We bridge all gaps of distance and difference when we are Genuine. The people I chose to nominate for this award are very genuine in their writing. No smoke and mirrors to be found. I am delighted when I see their blogs show up in my inbox; I know I will be inspired. ~ by Step On a Crack on March 4, 2012. Love your concept of presentation and the definitions too. I’m on my way to checking out your nominees. Great post! Thank you very much for being here! I LOVE the blogs I nominated; I hope you will too! Congratulations Jen. You are a genuine blogger. Congratulations to all nominees too. CAn you believe how many great writers and Genuine people there are ‘here’ is there a ‘here’ here??? You ARE the definition of Genuine, Jen! love and peace to you, dear heart! Thank you, Jen! The other nominees are much more talented than I, but I always appreciate your thoughtfulness. I beg to differ. You are not only a talented writer and an engaging one also: you are going to make one Hell of a Doctor. My Pleasure! I love your blog very much. You are the Genuine Article to be sure! IT is amazing here isn’t it?? OH Yes! Any day I can make your Heart lighter is a very good day indeed! Congratulations and keep being genuine. you dear Jen, are the Jenuine deal. Sorry for the pun, I mean you no pain.